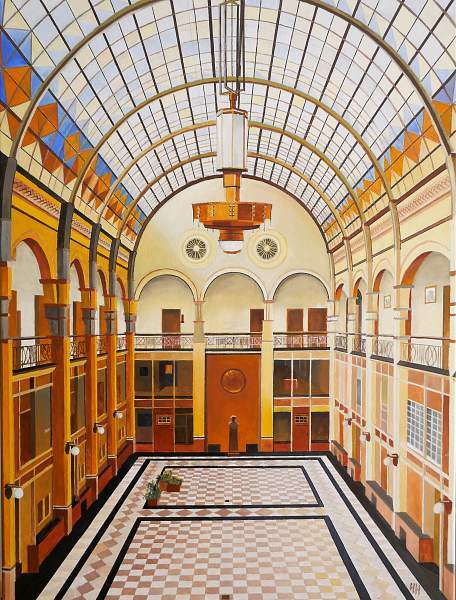 This painting was inspired by the office building (Big Office) of the former factory 'Royal Gist-Brocades' in Delft. The office was build in 1905 designed by the Amsterdam architects K. Muller and B. Schelling. The impressive big hall with glass roof is situated in the center of the building just after the Entrance building. Its shape and style are originated from the Rationalism, impressing its modernity and quality. The design has also been influenced by the University Museum of Oxford and the Exchange building ('Beurs') of the famous Dutch architect Berlage. The roof of the main hall has colored glass-work based on iron carriers and the floor consists of marble tiles. The Big Office of the Royal Gist-Brocades is an outstanding cultural and industrial heritage site not only because of the cultural historical value but also because of its architectural and town-planning interests. The building is an early example of the massive industrialization. In particular the special light and colors in the Big Office inspired Bert to create this painting.